We all love smart technologies. Smart phones, smart cars, smart houses, and so on. I have a device in my pocket that can relay my location by GPS, calculate the distance to my destination, count the number of steps it takes me to get there and displays the number of calories I burned; all of this while I stream cat videos from the internet. I can even control my smart house remotely from my phone, or have the doors to my smart car automatically unlock as I approach. It is glorious. Researchers and engineers are always looking to enhance the mundane by incorporating new technologies. Recently, researchers at the University of Washington, Disney Research, and the Carnegie Mellon University teamed up to develop PaperID, where common paper was imbued with smart technology to give interactive paper. PaperID uses two systems to drive their innovation: RFID tags and conductive ink. Conductive ink has been a recent discovery. Clever chemists have formulated inks that use conductive silver nanoparticles and silver chloride salts in fast evaporating media that can be used as printable (or handwritten) circuits. In fact, small kits of conductive inks and circuit boards are used to teach the fundamentals of electronics. For PaperID, they use similar inks that can be used freehand or with a stencil; the ink can also be printed as a sticker. What is different from other technologies is that the ink is used as a transmitting antenna as well. RFID is a radio-frequency identification system that uses electromagnetism to identify and track objects. The units are powerless; they gather energy from radio waves emitted from RFID interrogators. The RFID tags are the same as those used in stores to prevent theft. 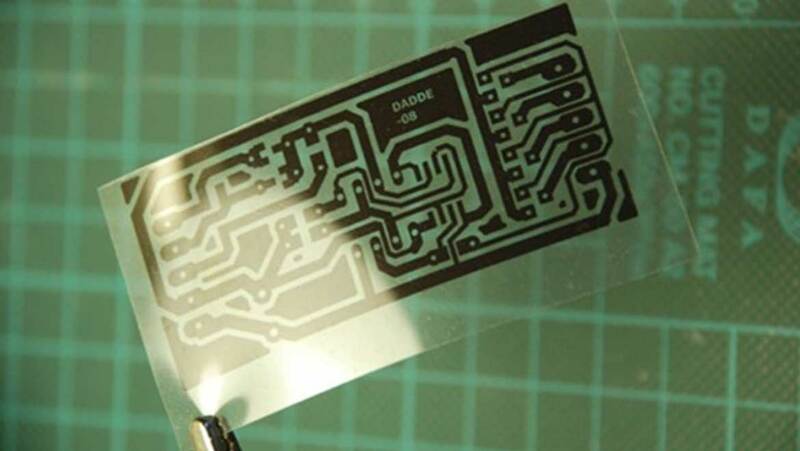 PaperID uses RFID tag stickers that are placed in line with the conductive ink. When the circuit is closed by a finger press, the RFID will transmit data through the printed ink antenna. The receiver can then detect the identity of RFID tag and will give instructions to a computer on the outcome. In the demonstration provided, things like swiveling a piece of paper, or pressing on a drawn button, will result in different signals, like turning lights on or off. The real challenge in developing PaperID has been signal detection. With the use of Received Signal Strength Indicators (RSSI), the team has been able to develop methods to detect many different types of hand motions, not just touching. The RSSI enabled modes can detect waving above the sensor, swiping, touching, free air motions, sliding, and rotations. Each tag that is used is individualized, but the cost is about $0.10 USD per tag. With a combination of RFID tags, intelligent computing, and gestures, the Disney team demonstrates how to create interactive paper media. The researchers chose to showcase this technology on paper-based media because it is inexpensive, ubiquitous, flexible, reusable, and simple; but they stress that this system can be applied to any material for a variety of scenarios. Educators could potentially use interactive worksheets with students to aid in learning while keeping them engaged. The RFID tags can be tracked to give position and velocity, concepts that can be used to teach simple physics in a classroom using paper cutouts of trains and cars. Replacing color markers for conductive ink, students can design interactive art while learning about circuits. Of course, it’s not just for children and classrooms, adults can also partake in the fun. These simple RFID systems can easily be incorporated into board games, creating a more interactive experience. Or they can assist in the office. Anyone who has ever had to collect a lunch order knows the pains of going about the office with a long list; now a single sheet can be used and it will tally the order and even submit the order for you. This system can even be implemented to aid the vision impaired. Realtime Wearable Alcohol Monitor That Has Your "BAC"